Having recently spoken about the issues of minimum wage, especially in the Irish context, here are some facts, based on Eurostat latest data. 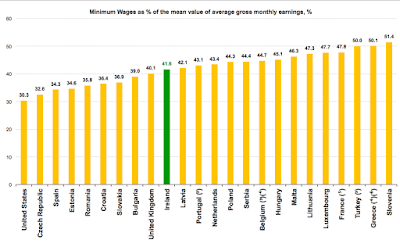 Firstly - about the level of minimum wages in Ireland relative to the EU counterparts. 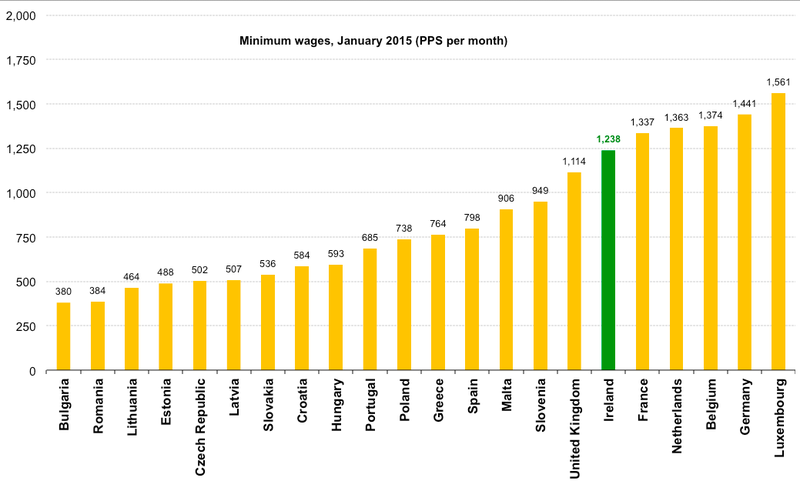 In monthly terms, Irish minimum wage comes in at EUR1,462 per month (1Q 2015 data). 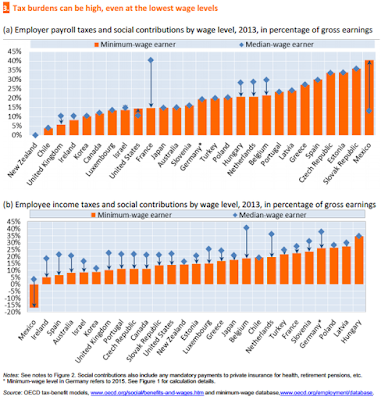 Despite some claims that we have the second highest minimum wage in Europe, this puts us in the 5th position just below 4th ranked Germany (EUR1,473 per month) and ahead of the sixth ranked France (EUR1,458 per month). 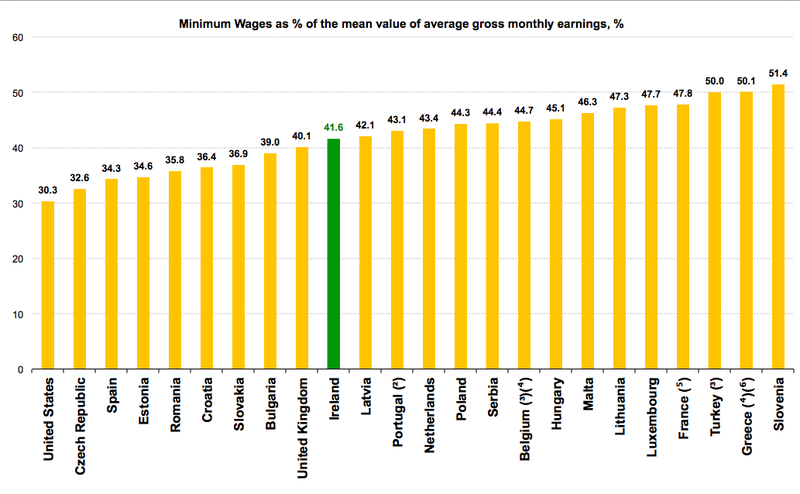 It is worth noting that Denmark, Italy, Cyprus, Austria, Finland and Sweden have no national minimum wage. 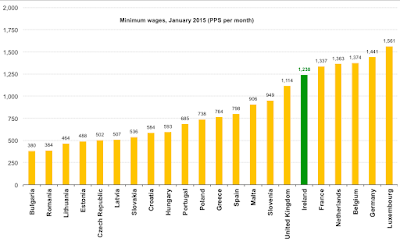 In terms of PPP-adjusted figures, Irish minimum wage is 6th highest in the EU at EUR1,238 per month (PPP). This is quite significantly ahead of the UK (ranked 7th at EUR1,114 per month PPP-adjusted), but below France (at EUR1,337 per month PPP-adjusted). Per chart above, minimum wage earners in Ireland earn on average around 41.6% of the gross average wage on a monthly basis. Comparable, but slightly more than their counterparts in the UK. What the above two charts illustrate is that Irish minimum wage is not set at an extremely high level, as some claim. They also show that crucial point for people earning minimum wages is the cost of living in Ireland, rather than just the level of wages they earn. My view, within the context of the Irish minimum wage debate is that we must focus more of our efforts on the cost of living side, less on incrementally increasing minimum wage. And more crucially, there is little point, in my opinion, to increase minimum wage by a small (token) amount, as variability of hours worked and zero hours contracts offered will erase much of the benefit to be gained by those still holding minimum wage jobs after the wage increase. 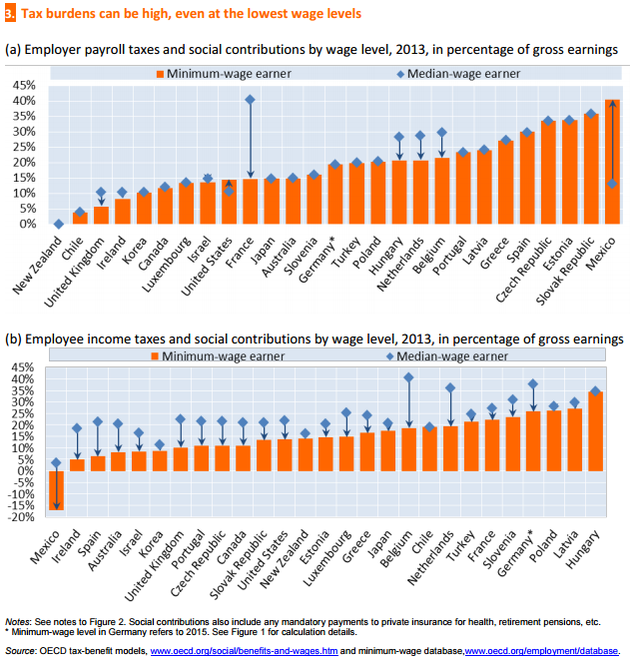 Given the levels of progressivity in Irish tax system, it is quite un-surprising that Irish minimum wage earners are carrying low tax burden on tax side, which does push after-tax minimum wage in Ireland to higher poll position in the league tables. On the other hand, the Eurostat data on which my analysis was based uses 39 hour weeks for computing minimum wage earnings, without adjusting for working days. Which, probably, pushes our minimum wage earners' annual incomes down (especially given the prevalence of low hours and zero hours contracts in some sectors). Thus, as a note of caution, all of the above data should be read as all economic data should be read: with caution and without attempting to make sweeping generalisations.